and hence of learning. Skat participates in many communities of practice and networks in both the North and the South. We are a learning organisation, eager to draw lessons from our experiences and to share these with others in the development community. 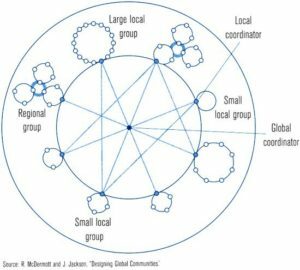 In some networks we play a coordinating role and support the establishment of new networks. An interdisciplinary Swiss community of practice bringing together a wide range of specialists to promote wider and deeper understanding of key issues in water supply, sanitation and hygiene in developing countries. The AGUASAN group, based in Switzerland, is one of the oldest existing sector specific communities of practice on the Swiss development scene. Founding members belong to several Swiss development and development research organisations, including the Swiss Agency for Development and Cooperation (SDC), Water and Sanitation in Developing Countries (SANDEC), Helvetas and the Skat Foundation. Since 1984 AGUASAN has regularly brought together water and sanitation experts from around the world in 3-monthly meetings to discuss current trends and innovations in the field of water supply and environmental sanitation. Above the regular meetings, AGUASAN also holds annual summer workshops in Switzerland, bringing together project field staff, desk officers, researchers, experts and consultants for a week of exchange and reflection on selected development issues. AGUASAN workshops are clearly intended to foster a mutual learning experience, particularly making participants with a technical background more aware of non-technical aspects of water and sanitation development. Besides this major goal, the workshops also aim to utilise the broad and multi-faceted knowledge and experience available within the group, by developing and examining strategies and conceptual tools that will be of practical use in development cooperation. Recent themes of AGUASAN workshops include private sector involvement, the household-centred approach and the impact of personal paradigms. The reports of the most recent AGUASAN workshops are available for download in the publications section of the Skat website. The Rural Water Supply Network (RWSN) is a global knowledge network for promoting sound practices in rural water supply. RWSN grew out of the need to focus greater attention on rural water supply challenges and to encourage the sharing of experience and knowledge between government institutions, NGOs and private agencies involved in rural water development. The SWP brings together relevant Swiss stakeholders active in the international water sector to promote sustainable and equitable use and management of water resources and universal access to water and sanitation. Skat is an active member of the SWP and has been contracted by HELVETAS Swiss Intercooperation to ensure as focal point of the “Suisse-Romandie” part of the partnership’s coordination and secretarial work. The Sustainable Sanitation Alliance (SuSanA) is an informal network of organisations who share a common vision on sustainable sanitation. SuSanA came into existence in early 2007 and works as a coordination platform, working platform, sounding board, contributor to the policy dialogue on sustainable sanitation and as a “catalyst”. The Sustainable Sanitation Alliance is a loose network of more than 134 partners – multi- and bilateral organisations, NGOs, private companies, governmental and research institutions. SuSanA aims to contribute to the achievement of the Millenium Development Goals (MDGs) by promoting sustainable sanitation systems. The Building Advisory Service and Information Network, basin, was set up in 1988 to provide information and advice on appropriate building technology and to create links to know-how resources for all those in need of relevant information: government officers, financiers, builders and developers, architects and planners and building material producers – anybody in need of up-to-date information and advice on the manufacture, performance and availability of sustainable building technology from around the world. There are currently nine active members aiming to provide clients with access to building technology and advice. These advisory services are provided via the half-yearly newsletter “basinNews”, internet-based information services such as databases, international seminars and conferences and Q&A services. The network partners also meet periodically to discuss and present new issues and trends in sustainable building technology. Today, basin has become the leading international network for knowledge sharing on building construction and habitat issues. Skat actively supports and is member of the Hydro Empowerment Network HPNET, a network of micro and mini hydropower practitioners in South and Southeast Asia. Skat assisted HPNET in its restructuring process (2016/2017) and implemented a series of webinars in cooperation with HPNET and Energypedia on various mini grid topics. The webinars provided an excellent platform for practitioners and international organisations to share their experience. Skat’s staff has been nominated to become part of HPNET’s advisory board and as such assists HPNET in strategic and advocacy aspects. The Swiss Small Hydropower Association ISKB assists its members in all questions about Small Hydropower Plants (SHP) and organises and implements annually the bilingual Swiss SHP symposium. Its magazine “Das Kleinkraftwerk” is published three times per year. The market guide shows the most relevant market actors in Switzerland. Skat hosts the secretariat of the Swiss Small Hydropower Association ISKB and is the principle driver and co-ordinator of networking, fundraising, management and advocacy activities. An international community of practitioners working in the field of knowledge sharing and knowledge management in development cooperation and humanitarian aid. The International Forum for Rural Transport and Development (IFRTD) is a global network of individuals and organisations interested in rural transport issues in developing countries. The network vision is “improved accessibility and mobility for poor communities in Asia, Africa, and Latin America”. We aim to achieve our mission by strengthening and supporting networking, identifying priority issues for change, and pursuing a programme of advocacy work to influence donors, policy makers and practitioners. We seek to fill gaps in knowledge by promoting and disseminating research in a way that enhances networking, generates awareness of issues and advocates for appropriate changes and resource mobilisation. The IFRTD is committed to ensuring that the interests of developing countries are represented in the global rural transport agenda, and that the interventions of it’s members both support and are informed by these interests. Members of the IFRTD network include representatives from governments, academia, multilateral and bilateral donor agencies, consultancies, technical institutions, national and international NGOs and community organisations. Membership of the IFRTD is open to all who share its vision, objectives, values and principles. IFRTD strives to provide all members with equal opportunities to particpate in the activities of the network. It encourages members to take ownership of the network and participate in decision-making processes. Please click here to find out more about joining the IFRTD. TransNet is a Swiss-based informal community of practice with the aim to promote the dialogue and to co-ordinate and exchange information, know-how and experiences as a basis for mutual learning with other public and private, national and international actors in the field of mobility and transport. TransNet aims to promote dialogue and to co-ordinate and exchange information, know-how and experiences as a basis for mutual learning with other public and private, national and international actors in transport infrastructure. The network draws on the experience of its members and provides opportunities for constructive interaction between transport infrastructure professionals in the Swiss development and research communities, in Swiss municipalities, and in private consultancy, as well as others interested in the problems and issues of transport infrastructure in developing countries. Since 1999 TransNet has regularly held meetings, and the increasing number of participants and interested organisations indicates its growing success. The meetings allow a useful exchange of experiences and information among its members and provide a high-level forum for discussing important issues in transportation, including technical and institutional aspects, particularly public-private partnerships, poverty & transport, good governance and community involvement. The members’ list currently includes 31 individuals from 17 different organisations and companies. One substantial output of TransNet is the TransWeb, an Internet portal to the transport sector providing selected links to up-to-date information on various aspects of transport. The CWG is an informal network of various actors – individuals and institutions – interested in and working for improvements in solid waste management in the context of developing countries. The network evolved out of a donor coordination and state-of-the-art review conference in Ittigen, Switzerland in 1995, which was followed by a series of international workshops organized by a changing and diverse array of actors from different organizations: 1996 in Washington and Cairo, 1998 in Belo Horizonte, 2000 in Manila and 2003 in Dar es Salaam. The next CWG workshop will be held in February 2006 in Kolkata, India. Although not a formal membership organization, the CWG network or community of practice contributed to the thematic discussion through these workshops and through many publications developed by participants in response to the themes set as the workshops, such as micro-enterprise development, public-private partnerships, and solid waste collection that benefits the urban poor. Skat has been one of the driving forces within the CWG since its inception, and is presently hosting the CWG Secretariat.